Washington: The US Navy said Saturday it had sent a carrier-led strike group to the Korean peninsula in a show of force against North Korea's "reckless" nuclear weapons program. North Korea denounced Thursday's strike as an act of "intolerable aggression" and one that justified "a million times over" the North's push toward a credible nuclear deterrent. 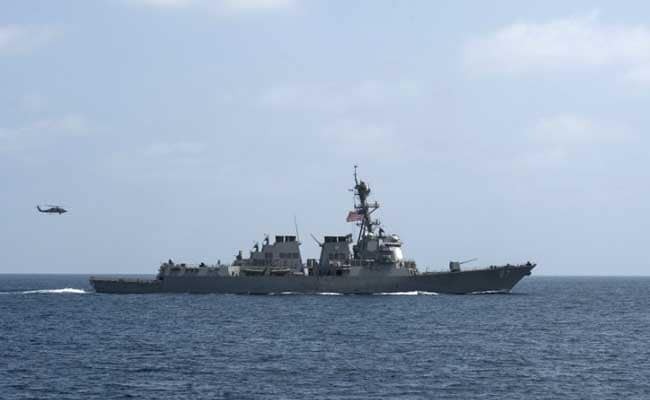 "US Pacific Command ordered the Carl Vinson Strike Group north as a prudent measure to maintain readiness and presence in the Western Pacific," said Commander Dave Benham, spokesman at US Pacific Command. "The number one threat in the region continues to be North Korea, due to its reckless, irresponsible and destabilizing program of missile tests and pursuit of a nuclear weapons capability," he told AFP, in an unusually forceful statement. Originally scheduled to make port calls in Australia, the strike group -- which includes the Nimitz-class aircraft supercarrier USS Carl Vinson -- is now headed from Singapore to the Western Pacific Ocean. Expert satellite imagery analysis suggests it could well be preparing for a sixth, with US intelligence officials warning that Pyongyang could be less than two years away from developing a nuclear warhead that could reach the continental United States. Last August Pyongyang also successfully test-fired a submarine-launched ballistic missile 500 kilometres (300 miles) towards Japan, far exceeding any previous sub-launched tests, in what the North's leader Kim Jong-Un hailed as the "greatest success." On Thursday and Friday, US President Donald Trump hosted his Chinese counterpart Xi Jinping for talks during which he pressed Pyongyang's key ally to help curb the North's nuclear weapons program. Trump has threatened unilateral action against the hermit state, a threat that appears more palpable after Thursday's strike on a Syrian airfield following an apparent chemical attack.